After NYC truck attack, how can we go beyond reactionary design responses? - Archpaper.com After NYC truck attack, how can we go beyond reactionary design responses? Ever since a terrorist in a rental truck sped down the Hudson River Park Bikeway in Lower Manhattan this past October 31, killing eight pedestrians and cyclists and injuring 11 others, the popular bike path has been in lockdown mode. Unsightly concrete Jersey Barriers have been temporarily placed at the entrances off the highway onto the bike path narrowing rights of way for cyclists, and police cruisers are monitoring crossings into the adjacent Hudson River Park. The recent terrorist attack has sparked calls to fortify the bike path against further incidents, and the state department of transportation, which oversees the bike path, is studying the issue. Recently, Signe Nielsen, a principal of Mathews Nielsen Landscape Architects, which designed the bikeway, spoke to AN contributor Alex Ulam about how we can better safeguard the public realm and her concerns that planners will start fencing off public spaces with an excessive number of bollards. 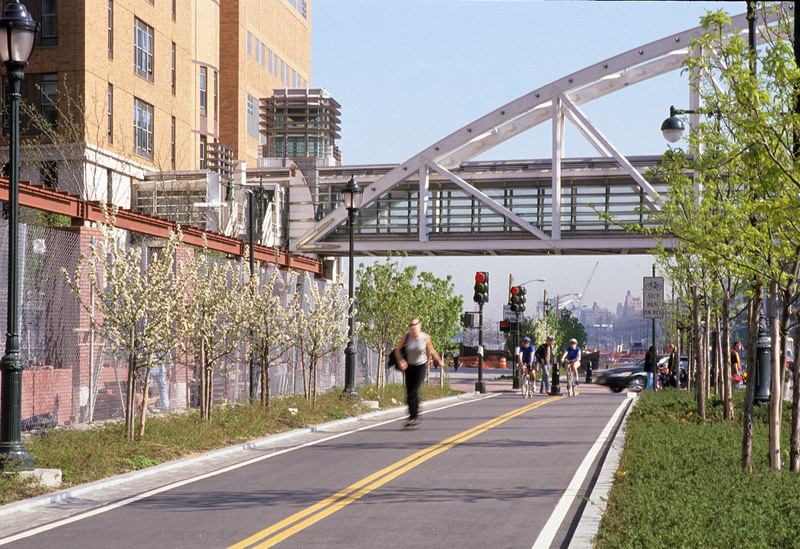 The Architect’s Newspaper: What would the solution be for preventing a future attack like the one that occurred on the Hudson River Park Bikeway? Signe Nielsen: Well, I think there are larger issues. I’m astounded that in light of the mass murders—particularly in Las Vegas and now in Texas—that we don’t respond with gun control, and yet we are willing to act quickly in a reactionary way to a single threat. I think there’s another philosophical point: Are we a country that is going to live in fear or not? There is no way that we can bollard our entire world, and if we do, then someone will figure out something else. So I don’t even want to address whether a bollard is retractable, collapsible, telescoping, whatever; I don’t believe it’s the right approach fundamentally. We already have had cyclists mowed down on the bikeway by cars going off the highway by mistake. Yes, but sadly people get killed on bicycles all over the city all of the time by vehicles. All you have to do is look at the crash statistics on the Department of Transportation website and you know that the number of injuries or deaths on bikes has gone up because of more people riding bicycles. So, I think that we really have to separate out all of the issues, because if we bollard the entire West Side bike lane, X, Y, or Z terrorist is just going to go find another place to do it. But what measures can they take to prevent cars from going onto the bikeway by mistake? This problem has occurred at Pier 40 and it has occurred at Pier 76. There have been incidents where a driver doesn’t know where they’re supposed to turn or is not paying attention and starts wandering down the bikeway. So, they have put in stoplights for bikes and a single bollard to try to slow bikers down. But we are going to create a situation where it’s also going to be extremely difficult, if not near impossible, depending on what they decide to do with the spacing of those bollards, to be able to maintain the park. I’m not opposed to stopping an errant vehicle as long as the bikes can get through, the maintenance vehicles can get through, and an idiot driver can see it. But it’s a very, very different scenario than lining the West Side Highway with bollards. There is a yellow bollard at Pier 76 that was installed after the accidents. If, for some reason, we want to behave in a reactionary way, then I think that the use of a high curb that provides some level of flood protection and planting soil is a better way to go than bollards. A higher curb is not an obstruction to cyclists, and it certainly looks integral to the design.